In 1964, the British Royal National Lifeboat Institution (RNLI) had a problem with their lifeboats. They were built using fabric and inflated, making them buoyant and light, but they often suffered heavy wear and tear and quickly developed punctures when they ran ashore. To try and fix the problem, they started developing an innovative craft with large inflatable buoyancy tubes and a rigid plywood hull. After a great deal of experimentation, RNLI changed the course of boating by developing the first ever concept for a rigid inflatable boat (RIB). There were several iterations of the RIB after that first attempt, but one of the most significant came in 1997 at the bottom of the world when a chap called Tony Hembrow had an idea. 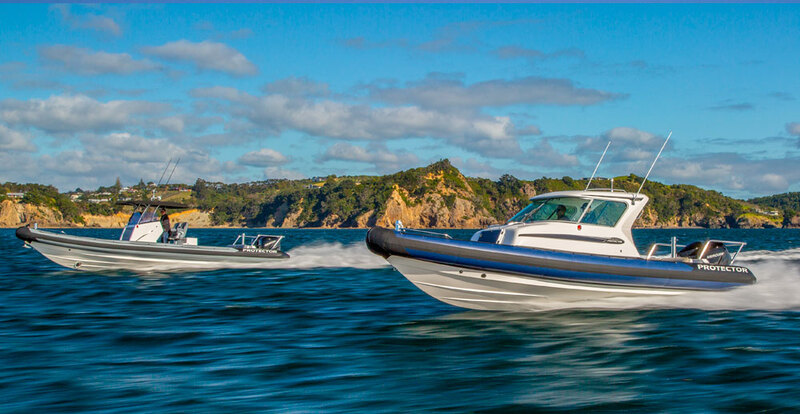 Tony Hembrow is the founder of Rayglass, and had been developing fibreglass boats since 1985 in Pakuranga, Auckland. Tony had a vision of building a RIB that was more practical and attractive. To do so, he’d use the legendary Rayglass hard sided hull on the Legend 850, which had built a reputation for superior rough water performance and handling. Soon after Tony had his vision, the company’s first RIB was born and named the Rayglass Protector 850. To get the brand off the ground, he appointed Lyndsay Turner as sales and marketing manager for the Protector. Over two decades later Lyndsay and Tony are still working together here at Rayglass. 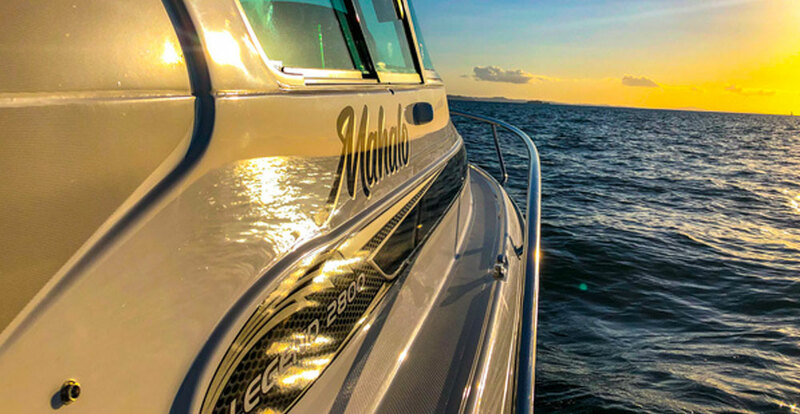 The first Protector was powered by twin 150hp Yamaha outboards and was successfully sea-tested countless times on flat water. Tony and Lyndsay and a few other staff knew they were onto something special a few weeks later when they put the durability of the boat to the test in a gale force storm. When the Rayglass Protector was first built, RIBs weren’t a common or popular boat here in New Zealand, which made selling them a difficult challenge. The inflatable rib in a Rayglass Protector acts as a dampener. This means when you’re navigating rough seas, most of the vibration and noise associated with hitting a wave is eliminated. The inflatable rib also provided extra flotation for the vessel and additional buoyancy uplift over waves, allowing them to perform well in all weather. The Protector’s soft inflatable sides mean that you can come up alongside other boats or objects without causing any damage. 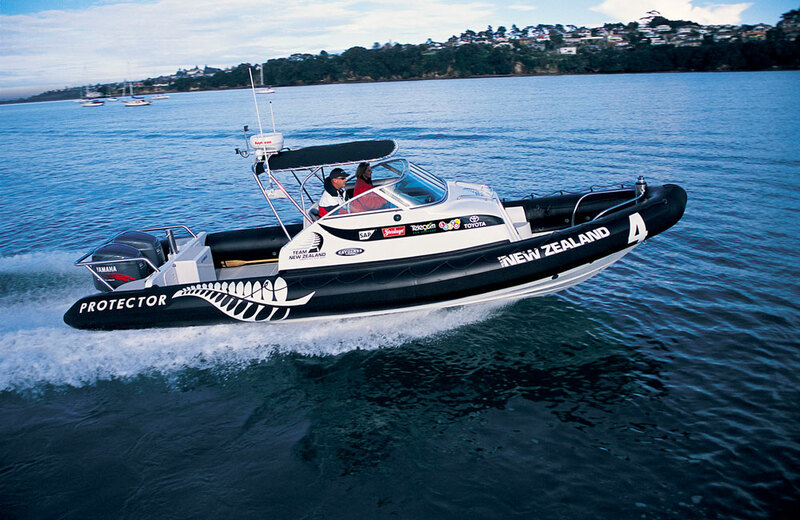 The team decided these boats had an obvious appeal to organisations like the New Zealand Coastguard. 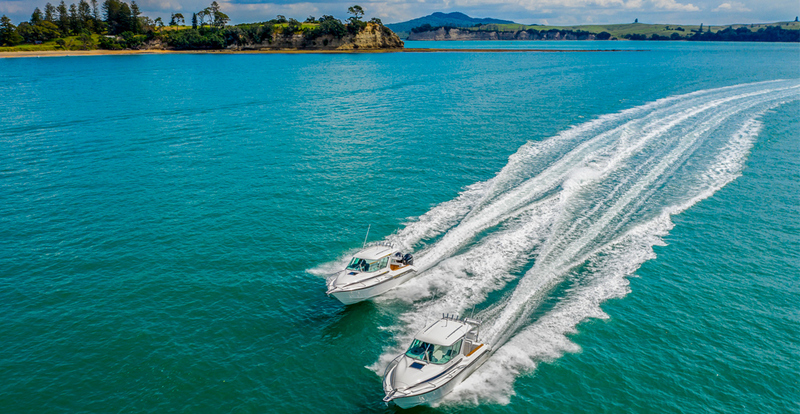 Lyndsay and Tony set out to get their first orders, eventually selling new fleets of Rayglass Protectors to the Auckland, Northland and Waihi Coastguard stations and the Auckland Regional council as patrol boats. 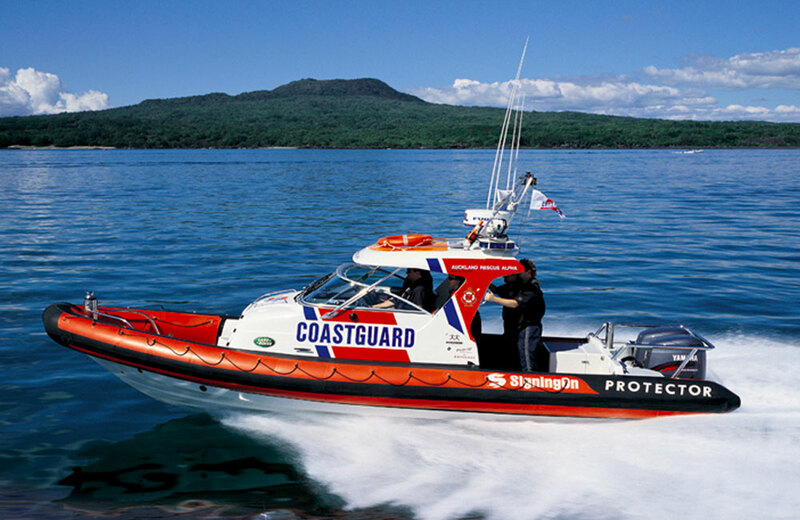 Word of the Rayglass Protector got out and eventually it became a popular vessel for the entire Royal NZ Coastguard nationwide. In the year 2000, the Rayglass Protector solidified its reputation as one of the best work boats in the world when the America’s Cup was held in Auckland. Protectors proved extremely popular as support boats for many of the teams during the competition. They were favoured for their rough water handling, ability to pull up alongside yachts without causing damage and their large deck spaces with ample room for spare sails, race crew and support crew. Since then, the Rayglass Protector has been the go-to support boat for many America’s Cup officials and teams. That includes the upcoming 2021 competition, for which we’re supplying 24 Protectors ranging from 9 to 12.5 metres in length. Popularity with the global superyacht fraternity followed Rayglass’s America’s Cup success, due to their practicality as specating vessels for the America’s Cup races, as well as everyday use. Since the Rayglass Protector’s breakout success with the Royal NZ Coastguard and during the 2000 America’s Cup, it’s now found several other uses, both recreational and industrial. The boats are now used by the military, police, customs officials, media, divers and by keen fishermen. They’re often used as chase boats, island hoppers, superyacht tenders and much more due to their class-leading capability and easy practicality. More than two decades after they first worked together, Tony and Lyndsay are still here at Rayglass in Mt Wellington. If you’re keen to talk boats or find out more about the Rayglass Protector series, drop in to our showroom to experience them for yourself.